In this series we'll see the Contact Moves for world class returns. In this new series of articles for Tennisplayer, I will be outlining my system for developing world class footwork on the return of serve. In this first article, we will go over the basics of court positioning on the return. We will also outline the routines that players should follow before the return, and how they should start the return movement patterns. I will also explain the concept of the Contact Move itself, including the return types and components. Then, in the following three articles, I will detail the Contact Moves options for all the returns: forehands, one-handed backhands, and two-handers. If you wish, you can see them all for yourself and study them in advance by clicking on the examples below I've filmed with two of my students who reached the top 100 in the world. 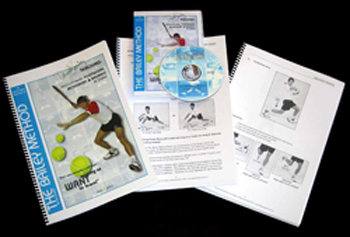 As I have explained in previous articles, I developed the concept of the Contact Move to help explain the bewildering and complex variations that top tennis players use in moving around the court, setting up, executing strokes, and recovering for the next ball. (Click Here.) A Contact Move is an conceptual overview that allows us to understand the variations top players use and why. Click Here to study the range of world class return contact moves. These articles are the natural continuation of my previous Tennisplayer series on the Contact Moves for the groundstrokes. I believe we should teach returns only after all the Contact Moves have been taught and understood on the groundstrokes. Although I will outline the Contact Moves in detail for all the various returns, if you are not familiar with the concept and its components on the groundstrokes, it may be helpful to peruse those articles first. (Click Here.) Once you familiar with the groundstroke patterns you can experiment freely in applying the Contact Moves to your returns. My research and observation shows that there are 10 Contact Moves that happen most frequently on returns in matches. It is important that players experiment with the different moves and use the ones that work for them, as there are often multiple options. The type of Contact Move a player uses on a return in a given situation depends on many factors. Is the return a forehand or a backhand? Is it a topspin return, a drive, or a slice? Was the ball served, wide, down the middle, or at the body? Andre Agassi: perfect footwork makes for effortless, powerful returns. 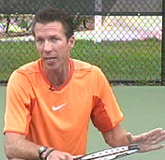 Are you running around the ball to hit a forehand return? Other factors include whether the ball is fast or floating, the height of the ball, and the type and amount of spin. Depending on the answers to these questions, the return Contact Moves fall into three categories. The first category is offensive returns. The second category is rally returns, where the returner is attempting to start the point on a neutral footing. The third category is defensive returns. I teach offensive returns first, followed by the rally returns, and then the defensive returns. This is because having an aggressive return of serve puts you on the attack from the very beginning of the point. When possible, it is the first choice for successful players. But obviously all three options are necessary at different times. The goal in working on the return contact moves is the same achieved by the great Andre Agassi. To position yourself perfectly as if you had all the time in the world, while your opponents are rushing, jumping, twisting and turning. Regardless of the type of return and the actual Contact Move involved, all good returns are based on principles of court positioning. Court positioning is all about understanding angles, geometry and reading the clues and cues that the opponent shows down at the other end of the court. In the ready position, the shoulders are rotated in line with the direction of the oncoming ball. There are 3 important factors when positioning yourself on the court for the return. The first factor is how you angle your body in relation to the angle of the oncoming ball. The second is where you position yourself left to right. Should be you be more toward the sideline, or more toward the middle of the service box? And finally, the third factor is the depth of your return position. Basically, in the ready position your shoulders should be squared to the angle of the oncoming ball as it starts towards you from your opponent's court. This means that your shoulders are rotated slightly toward the server. In the deuce court your right shoulder is therefore a little closer to the net. In the ad court, it's the opposite. Your left shoulder is slightly closer to the net. If the server moves wider, further away from the center T in either court, this angle of the shoulders becomes more extreme as well. Midpoint positioning allows you to cover the widest serves you opponent is capable of hitting. The left to right positioning is crucial on the return, because when correct it gives you the maximum time to react and the minimal distance to move. This decision depends upon where your opponent is able to hit his serves and how much of the service box he is really able to use in both courts. The goal is to bisect the angle of your opponent's greatest possible range. I call this the midpoint recovery position. The midpoint will be different for different opponents. If the player almost always plays to the forehand in the deuce court, or almost always plays to the backhand in the ad court, you should shift your starting position accordingly. If your opponent cannot serve wide in the deuce court, you can position more to the middle of the box. If he cannot serve the T in the ad court, then you can move more toward you backhand side and increase your ability to move around the ball and hit forehand returns. One more critical point to understand about mid point positioning is what happens when you play a return down the line. First, you must understand that you must recover further if you return down the line. Second, you must be well balanced to attempt this return as it is more difficult and risky. The recovery is further when you return down the line. You are hitting over the highest part of the net, into the short part of the court, and are usually changing the direction of the ball flight. This means that you will usually need to use crossover recovery steps after the return, which are more difficult to master, but faster and more efficient. Unless of course you go for a winner and make it! How deep you stand will vary with your style of play, personality, skill level, your opponent, and the court surface. It may also vary on the type of contact move you prefer, whether you lie taking control with offensive contact moves, neutralizing the serve with rallying contact moves or if you prefer responding to serving pressure with defensive contact moves. A good fundamental starting position is with the toes on the baseline. When you are really attacking the ball with your feet, you can move further forward For defensive returns you can start 3 to 5 feet behind the baseline. In extreme cases you could move back as much as 10 feet. This is often when you are struggling to deal with the pace of the serve or the height of the bounce. Players can start behind the baseline, on the baseline, or move up inside the court. As a returner you should develop a routine that you use every time you return. For this reason, feeling comfortable and confident with your routine is paramount. Many players have poor routines or no routines. But pro players are incredible deliberate. A routine helps you focus on the task at hand and gets you ready to react to the best of your ability. I teach a 5 step progression on the return routine, although every player can and should modify the steps to suit their style and feel free to add their own personal flair. Step 1 is Getting Ready. Walk up in a confident and relaxed manner to their preferred returning position on the court. Perform ready steps when the opponent is bouncing the ball in preparation for the serve. Get into a strong athletic position when the opponent has stopped bouncing the ball and is getting ready to serve. Rafael Nadal practices his own unique version of the 5 step return progression. Step 2 is Reading the Toss. Take a small step forward with the dominant foot (player preference) when the player starts the upward phase of the ball toss. Step 3 is Reacting. Take the split step when the opponent strikes the serve and then adjusting the feet with correct steps needed for the hitting stance you choose. Step 4 is Responding. Now execute the actual Contact Move. As we will see in the upcoming articles, the Contact Move can be offensive, rallying or defensive, depending on the effectiveness of the opponent's serve and the returning player's mindset. Step 5 is Recovery. Good recovery is necessary to prepare for the next shot. Recovery when there is movement to the ball can involve a brake step, as we will see. After this, recovery about the steps needed to regain the midpoint position, depending on where you have hit the return, the effectiveness of the return, and whether you struck it from behind the baseline or closer in. As I said, every playing will develop his own rituals and routines, which is part of the fun and the creative process of becoming a tennis player. But I do believe that certain elements are non negotiable on every return. The split step: the number one non-negotiable return element. Split stepping at the server's ball contact. You must react quickly to the serve and a split step puts you in a strong reactive athletic position at the correct time. Starting the routine with a good ready position with the feet wide apart, standing on the balls of the feet, with good body alignment and the knees slightly flexed. Creating a body language that conveys confidence and concentration. Great balance after the return so that brake and recovery steps are automatic and effective. Using the contact moves that match the approaching service ball and works for you. Before we move on to the Contact Moves themselves, let me also outline some of the most common errors I see on the return, even for high level players. Not split stepping when the opponent makes contact with the ball. Not moving the foot closest to the ball first when the ball is a comfortable distance away. Bending at the waist instead at the knees. Not shifting sideways with the feet apart when the ball is heading towards the body. Keeping the feet too close together. Standing too far in or too far back to return serve. Not practicing the recovery steps when training your return. Using the wrong contact move on the wrong ball. Not moving in to take advantage of a weak second serve. Side skipping instead of making a crossover step when a large distance needs to be covered quickly. A debated point in the discussion of the kinds of complex footwork patterns that you find in pro tennis is this: Can they be taught? Or are they natural, athletic moves that players develop on their own? Or can they be developed through systematic coaching? Are great Contact Moves natural�or developed through coaching�or both? The answer is to both questions is yes. Often times players naturally get them right. The fact is top professional players used all these movement patterns long before I came up with a concept to describe them. So there is always an argument for not fixing what isn't broken. At the same time, footwork is a critical part of successful tennis at all levels, and the majority of players I see struggle with poor patterns of movement on some percentage, or even a high percentage of their shots. In my personal experience, I have had great success training competitive players, including players in the world top hundred to execute the various Contact Move patterns in a disciplined and systematic way. Other players or coaches may find the best way to apply these patterns is as needed. If you struggle with a particular return, or as a coach you see that your player is struggling, you can analyze the pattern of their Contact Move, and then compare it to the world class patterns demonstrated in these articles. So that's it for our introduction. Now get ready to master the 10 key Contact Moves to return like the pros!